Fakenewsflash: the recent Facebook post claiming to be from David Attenborough, suggesting that we should feed floundering bees a sugar solution to ‘save’ them, was faked. I’m not on Facebook, but I saw the original post via Twitter, where many popular non-profit and government organisations promoted it (it now seems that many have deleted their posts). Bumblebees are frequent flyers – what are the impacts? Addressing pollinator introduction policy and the effects introduced species can have on local ecosystems, Romina Rader, Manu Saunders and Tobias Smith discuss the recent Policy Direction, Coordinated species importation policies are needed to reduce serious invasions globally: The case of alien bumblebees in South America by Aizen et al. Robo bees are back, but will they last? The robot bee story is back in the news. I covered some of the new research and associated media hype last year. The latest: a patent has been filed for building ‘pollinator drones’ and the media (both newsy and social) are in despair, as the end is clearly nigh. Pollination is a complex process. It’s not as easy as an insect simply visiting a flower. This is important to remember when talking about which species are the ‘best’ or ‘most important’ pollinators. Simply observing an animal visiting a flower is not, on its own, evidence that the animal is pollinating the flower. 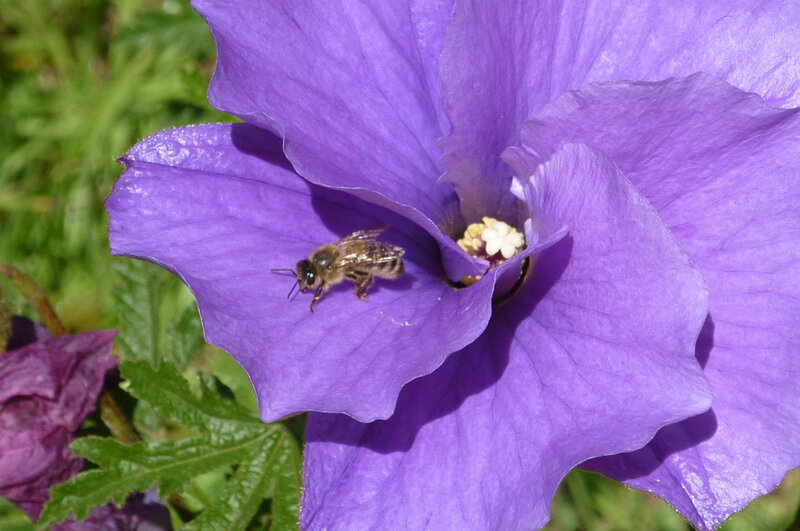 Many insects (and other animals) visit flowers, to feed on pollen, nectar or other flower parts. Many of these interactions result in pollination…although some visitors are better pollinators than others. Some of these visitors commit floral larceny – they are robbers or thieves (there’s a difference!) of either pollen or nectar, and they leave without pollinating. Some might even damage flower parts so much that they indirectly affect the flower’s capacity to be pollinated by other visitors. ‘Avoid repetition’. Most scientists had this command drummed into their heads early in their career. Science writing should be devoid of repetitive words and sentences. I had to include a preface in my PhD thesis to warn examiners of impending repetition…because my thesis chapters were published/submitted studies from the same system and with somewhat similar sampling methods. Why did the pollinator cross the road? The concept of the ‘edge effect’ has inspired long and varied discussion in the ecological literature. In essence, an edge effect is a change in animal or plant communities seen at a boundary between two types of habitat. These changes are most obvious in plant communities, for example where a swamp segues into a savannah. So, historically, research into edge effects and ecotones (the zone surrounding the edge where two plant communities meet, and energy fluxes and dynamics change) was mostly focused on plants. It wasn’t until the mid-1900s that people started considering how edges affected animals. Vegetation ecologists had already discovered that the zone surrounding habitat edges usually had more plant species than either of the two patches that met at the edge. The British Ecological Society has just published a ‘virtual’ journal issue on pollinator ecology, with all articles free to download for any reader, regardless of whether you have subscription access to the society. The articles are drawn from all five of the BES journals and cover all sorts of topical issues to do with honey bee health and biology, pesticide impacts and how management processes impact pollinators in agricultural landscapes. And if this virtual issue isn’t enough for you, the Journal of Pollination Ecology is another permanently ‘open access’ peer-reviewed journal that publishes articles covering lots of different aspects of the wonderful world of pollination. So click on the links to read the latest research on what modern life as a pollinator involves!